Linkyn Petersek of Colome is the Rising Stars reserve champion in breakaway roping. 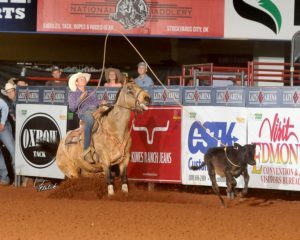 Over Thanksgiving break, Petersek went to Guthrie, Okla., to compete in the Rising Stars calf roping at the famous Lazy E Arena. This is the largest youth calf roping event in the world. The roping consists of three rounds and a short round. The top 15 make it back to the short go to compete for the average title. Petersek finished second in the first round with a 2.6 and then had runs of 2.99 and 2.91. He was the fourth high call back for the short go. He roped a 2.75 in the short go to win second in the average with an 11.25 on four head. Petersek won a saddle pad, a pair of Twisted X boots and $1,718. There were 381 runs in the breakaway roping on Saturday. Petersek also participated in the tie down calf roping. 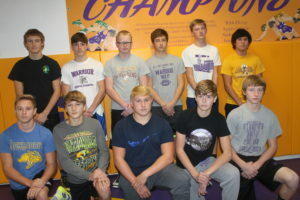 The Winner Area wrestling team will combine youth with a lot of wrestlers who have state meet experience. Spencer Novotny is starting his second year as the head coach of the Warriors. The Warriors will open the season at the Kimball tournament on Dec. 2. The meet will start at 10 a.m. and will feature 12 teams. There are 11 lettermen on the team. 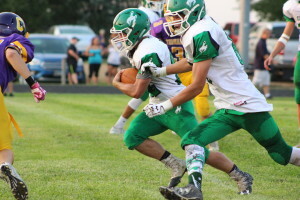 The lettermen include: Kaden Keiser, Achilles Willuweit, Joey Cole, Aaron Gilchrist, Owen Duffy, Trevor Peters, Landon Debus, Cailob Week, Wyatt Turnquist, Riggin Shippy, Atlas Willuweit. The two seniors on the team are: Atlas Willuweit and Jamin Dougherty. Others on the team are: Bosten Morehart, Preston Norrid, Sam Kruger, Dylan Ernster, Asher Kraft, Elijah Blare, Kaleb Osborn, Riley Shippy, Charles Pravecek, Enrique Guzman, Jack Kruger and Riley Orel. The Warriors lost six seniors—Kayleb Brozik, Tre Doren, Avery Gilchrist, Jayden Schroeder, Nick Blare and Tristan Watzel. Last year at state, Doren won first place at 285 pounds. Five wrestlers will return who placed at state last year. Kaden Keiser was 6th at 106, Wyatt Turnquist, 5th at 113; Atlas Willuweit, 4th at 120; Trevor Peters, 6th at 126 and Sam Kruger who wrestled for Kimball last year placed third at 138 pounds. “We are a young team but we return a lot of experience,” said Novotny. “We have a lot of kids who were a match away from qualifying for state a year ago,” said Novotny. The Warriors have a lot of depth in three different spots. There are a several wrestlers in the lighter weights, 138 pounds and 160-170 pounds. Novotny says in practice the team has been working on a lot of techniques. He says there is a lot of high intensity in practice and as the season progresses there will be more intensity. The Warriors have a tough schedule. It has been several years since the team has competed in the Gregory tournament and this year will return to Gregory on Dec. 9. In the past, Winner has wrestled at the Rapid City meet which was same day as the Gregory meet. “We will find great competition in Gregory,” said Novotny. A new tournament for Winner will at Tri Valley on Jan. 13. This will allow the wrestlers to see some competition they have not seen prior to the state tournament. The regional will be in Miller and the state tournament will be in Sioux Falls. In Class B, Novotny says the top teams to beat are Canton, Mobridge/Pollock and Philip. He added Parkston is also a strong team. Novotny’s assistant coaches are Jayd Schuyler and Daryl LaDeaux. Feb. 3—Big Dakota at Stanley Co.
Jackson Kinzer of the Colome football team has been named to the Sioux Falls Argus Leader Elite 45 football team. Kinzer logged 80 carries for 950 yards and 14 touchdowns and caught 12 passes for 350 yards for the Colome Cowboys this season. On defense, Kinzer played safety, corner and linebacker, tallying 40 tackles, three interceptions and a score. The Colome Cowboys had a big season and have four members of the team on the Class 9B all-state team. Cowboy senior Kolton Salonen was joined by Jackson Kinzer, Beau Bertram and Layton Thieman. Salonen was one of the leaders of the Cowboy defense finishing with 65 tackles including 10 sacks and coming up with a fumble recovery. On the other side of the ball, he averaged 20 yards and 11 catches and scored five times. 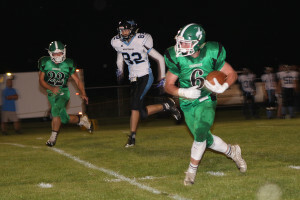 Junior Jackson Kinzer was named to the Class 9B offensive team. Kinzer finished with 1,400 all-purpose yards. He ran 80 times for 950 yards an 11.9 average—an 14 touchdowns while picking up 340 yards on 13 receptions with a 26.2 average with four scores. On defense, Kinzer picked off three passes and made 35 tackles. Bertram finished with 60 tackles, including three sacks. On offense, he had 240 yards on just 19 rushes and 110 yards on three receptions while totaling four touchdowns. Thieman, a ball hawking defender, came up with seven interceptions while adding a fumble recovery to go with 65 tackles. On offense, he went 35 of 70 for 737 yards with 12 TDs. Calvin Ringing Shield was named to the honorable mention list. Edna L. Winckler, age 94, of Yankton, South Dakota, died Friday, Nov. 17, 2017 at Avera Sister James Care Center in Yankton. Funeral services were held 10:30 a.m. on Nov. 27, 2017 at Riverview Reformed Church in Yankton with Reverend Rodney Veldhuizen officiating. Burial was in the Garden of Memories Cemetery in Yankton. Pallbearers are her grandsons: Steve Bender, Tom Winckler, Paul Dangel, Kelly Dangel, Mark Winckler, Randy Winckler, James Bender and Glenn Winckler. Honorary pallbearers are her grandchildren. Edna was born Sept. 3, 1923, south of Delmont, South Dakota in Charles Mix County, to Andrew Sr. and Katherine (Gramm) Fischer. She was the youngest of 12 children and the last Fischer of her generation. She was baptized and confirmed in Frieden’s Reformed Church of Tripp. She attended country school and completed her freshman year at Tripp, South Dakota. On June 28, 1941, Edna married Hubert Winckler in Tripp. They farmed for 26 years north of Tyndall, SD. She also worked at St. Michael’s Hospital in Tyndall, M-Tron Industries in Yankton and finally at Colonial Square Apartments in Yankton for 22 years. 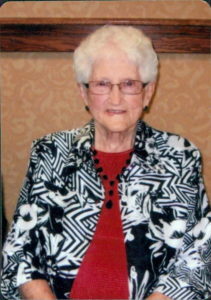 Edna was a member of Riverview Reformed Church in Yankton and a life member of the VFW Auxiliary Post No. 791 of Yankton. Edna loved playing cards, especially pinochle and whist, as well as playing marbles with her grandchildren. She also enjoyed doing embroidery work on dish towels. Above all, Edna loved family gatherings and providing a meal for them. “Come and let’s eat.” was one of her favorite sayings. Edna is survived by two daughters: Norma (Robert) Bender of St. Helena, NE and Arla (LaVerne) Dangel of Santa Rosa Beach, FL; six sons: Joewayne (Elaine) of Mesa, AZ, Myron (Barbara) of Winner, SD, Jarvis (Marilyn) of Avon, SD, David (Sue) of Vermillion, SD, Merlin (Lisa) of Collinsville, VA; and Larry (Barbie) of Bruceton Mills, WV; 25 grandchildren; 45 great grandchildren; five great-great grandchildren; brother-in-law, Bernard (Sophia) Winckler of Tyndall; and many, many nieces and nephews. Edna was preceded in death by her parents; husband, Hubert on June 17, 1995; son, Leland; one sister and ten brothers. The family would prefer memorials to be directed to Avera@Home, 501 Summit St. in Yankton, SD 57078 for the excellent care she received. John Ben Powell born on Nov. 13, 1947, in Winner, SD. 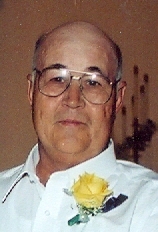 He was the son of Hazel (Merchen) and David J Powell, who farmed in rural Tripp County in South Dakota. John was a hard worker who loved to shoot the breeze with anyone. He was known for coming and going as he pleased with or without warning. He spent long hours on the road driving truck, but liked to tinker around in his garage. Camping, hunting, and fishing had always been his hobbies of choice. Those who went with, always came back saying that it had been quite the adventure. If you went out on a boat with him, it was always a good idea to bring an extra paddle along. John passed away in his sleep early on Nov. 17, 2017, due to complications caused by cancer. He was preceded in death by his parents, grandparents, and his brother, David L Powell. Those left to celebrate and honor his life are his three daughters Mandy Parks (Phil), Laurie Fisher, Sarah Powell, his step children Brandon Collins and Shannon Roberts (Nate), his 11 grandchildren, his brothers and sisters; Betty Lund, Don Powell, Rose Songer, Darlene Determan, and Richard Powell, as well as many cousins, nephews, nieces, and a host of other relatives and friends. SD Stockgrowers Association applauded the decision made Monday by the Federal Motor Carrier Safety Administration (FMCSA) to issue a 90-day waiver of new trucking mandates for trucks hauling livestock. The new regulations are set to go into effect on December 18 and require ELD’s to be installed in all commercial trucks. The require truckers to take regular breaks, limits the length of their drives and allows law enforcement to access those driving records on demand. The South Dakota Stockgrowers also sent letters to Senators John Thune and Mike Rounds urging them to join with others in the U.S. Senate to delay the requirement for electronic log devices (ELD) to be used by livestock haulers beyond the 90-day waiver. The Senate is considering legislation that would allow the ELD mandate to be implemented for all commercial trucks, but not require livestock trucks to use the technology until December of 2018. A public comment period on the delay is open until November 30 and the public can submit comments by visiting www.regulations.gov and searching for “NPPC Electronic Logging Device”. After 22 years with the United States Attorney’s Office, Randolph J. Seiler has announced his retirement. Seiler will bid farewell on December 31, 2017. Randy Seiler was nominated in 2015 by President Barack Obama as the 41st United States Attorney for the District of South Dakota. He was sworn in on October 8, 2015, by U.S. District Judge Roberto Lange at a ceremony at the U.S. Courthouse in Pierre, South Dakota. Prior to his appointment, he served as both Acting and Interim U.S. Attorney, and also as the First Assistant United States Attorney and the Tribal Liaison for the District of South Dakota. 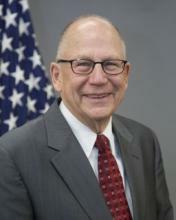 As First Assistant, Seiler was responsible for the day-to-day management and operation of the U.S. Attorney’s Office. He also supervised the U.S. Attorney’s branch office in Pierre, where he was directly involved in prosecutorial matters and decisions. As Tribal Liaison, he consulted and coordinated with tribal justice officials and leaders, tribal communities, and victim advocates in an effort to address any issues in the prosecution of major crimes in Indian country in South Dakota. Seiler has had a distinguished career as an Assistant U.S. Attorney. He spent 14 years prosecuting violent crime offenses. In 2001, he received the Department of Justice Attorney General’s Award for Fraud Prevention. In 2009, he became the first recipient of the Department of Justice Director’s Award for Superior Performance in Indian Country. In 2008, Seiler also served as Council to the Director in the Executive Office for U.S. Attorneys at the Department of Justice in Washington, D.C. He has been an instructor at the National Advocacy Center in Columbia, South Carolina, as well as a presenter at numerous conferences and trainings on various topics including violent crime, sexual assault, domestic violence, and legal issues in the prosecution of violent crime in Indian country. · The number of cases filed and defendants charged has risen significantly over the past three years, with approximately 200 more in both categories since 2014. · Established a dedicated Civil Rights Section within the office, spearheaded by a Civil Assistant U.S. Attorney. In addition to enforcing federal civil rights statutes, the Civil Rights Section strives to educate community members about their rights under federal law by engaging in outreach programs throughout the state. · Instrumental in the inception of the Guardians Project Task Force, which is designed to enhance federal law enforcement effort to expose fraud and public corruption in Indian country, by uniting the expertise and resources of the participating thirteen federal investigative agencies. · Made drug prosecutions one of the office’s top priorities by committing the U.S. Attorney’s Office to work with and coordinate drug task forces across South Dakota, including the newly created Northeastern South Dakota Drug Team. The District of South Dakota is now among the top ten federal judicial districts for drug prosecutions, based on population. This is a marked change from ten years ago, when South Dakota was not in the top ranks. · Revised the management structure of the SD U.S. Attorney’s Office to include more women and minorities, and has hired minorities as Assistant U.S. Attorneys and Special Assistant U.S. Attorneys, providing a more diversified approach to the offices’ priorities and focus. · Created “Walk-In Wednesday”, wherein a representative of the U.S. Attorney’s office is on-site at Pine Ridge each Wednesday. Seiler implemented this initiative to allow citizens to more easily communicate with the office concerning crime on the reservation, inquire about existing cases, or to obtain any information which might be sought by the citizenry. · Extended outreach in Indian country by holding community listening sessions, meeting with Tribal Councils, appointing Tribal Prosecutors as Special Assistant U.S. Attorneys, and implementing a “First Friday” call with Tribal Chairmen. · Initiated regular community based outreach meetings in Sioux Falls and Rapid City discussing such topics as civil rights, officer involved shootings, frauds and scams, immigration, and hate crimes. · Started a reentry program in the U.S. Attorney’s Office to address the high rates of recidivism. Prior to joining the U.S. Attorney’s Office in 1995, Seiler was in private practice in Mobridge, South Dakota, where he practiced criminal and civil law. He was appointed by the South Dakota Supreme Court to the Board of Pardons and Paroles and also served on the State Board of Education. He was elected to three terms on the Mobridge School Board and also served as a Special Judge for the Cheyenne River Sioux Tribe. Most recently, Seiler served his community as a member of the Fort Pierre City Council. Seiler grew up in Herreid, South Dakota, served his country in the U.S. Air Force, which included a year-long tour in Vietnam, and graduated with honors from the University of South Dakota School of Law. He and his wife, Wanda, live in Fort Pierre, and have four grown children and two grandchildren. Following his resignation as U.S. Attorney, Seiler plans to practice law in Fort Pierre, and pursue other opportunities. 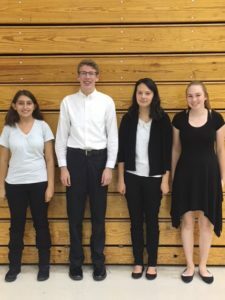 Winner High School oral interp team competed at the regional in Chamberlain. Results of the WHS students include: Presley Foudray and Kayla Natoli, 5th in duet; Andrew Taylor, 5th in storytelling; Megan Brozik, 5th in poetry; Shelby Scott, 5th in humorous; Presley Foudray, 7th in serious and Madyson Morehart, 5th in non-original oratory. 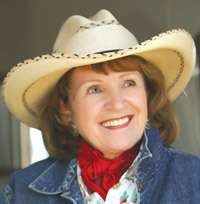 Yvonne Hollenbeck of Clearfield will be among the performers at the Black Hills Cowboy Christmas concert and dance Dec. 9 at the Historic Homestake Opera House in Lead. Hollenbeck will be performing several of her poems. This year’s event feature 15 performers. The matinee show is at 2 p.m. and the evening show is at 7:30 p.m.